No matter who we are, we all need mouth care. If your patient is on bedrest, they may need help with this care. Some patients will need denture care as well. How often should they receive this care? After each meal is best but after they get up in the morning and before they go to bed is standard. If your patient can ambulate to the bathroom and provide this care to themselves, let them. Or maybe they just need the supplies brought to their bedside table and they can do the rest. Always make sure they are as independent as they can be. Working in a hospital, I sometimes have to not only bring these supplies to the patient, but set everything up as well. First, if they are in a hospital bed, raise up the head of the bed as high as it will go. You may have to reposition them if they are not at the top of the bed. Then put the paper towel or washcloth around the front of the patient's neck just in case saliva or toothpaste drips during the process. Dip the toothbrush in the cup of water and put toothpaste on it. Never put very much. About the size of a pencil eraser is plenty. After that, hand your patient the toothbrush and let them brush their teeth if they are able. If not, read the next section below. After they are done, take the toothbrush from them and put the emesis basin underneath their chin so they can spit out the toothpaste. Then give them water to rinse out their mouth and let them spit again. Some patients like to rinse multiple times so make sure they don't want to again. Lastly, pat their mouth dry with the paper towel or washcloth and lower the head of their bed back down if they desire. Some patients require complete assistance when giving mouth care. If they do, be very patient and extra careful. Some people have very sensitive mouths. After setting up the toothbrush, have the patient open their mouth and place the toothbrush at the top of their mouth at the gums. 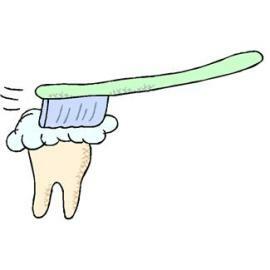 Brush with a downward stroke again and again starting at the gums until you have covered the front of their top teeth. Then brush as much of the back of their teeth as you can with the tip of the toothbrush. Do the same with the bottom. Start at the gums and brush upwards until you have covered all of their bottom teeth. Brush the back of them as well. Next brush the top of the thick teeth on the sides of their mouth, or molars as they are called, back and forth from the inside of their mouth to the front. You can brush their tongue but just be careful not to brush too far or you will gag them. Some patients like to use dental floss, mouthwash, or chap stick while receiving mouth care as well. My hospital personally doesn't supply these things so patients have to bring their own if they want this type of oral care. If they do and they need help, take out a piece of floss that is about a foot long and wrap both ends around your index or middle finger multiple times and pull it tight. 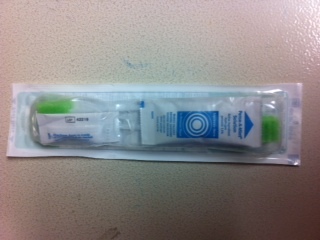 Then slide the floss in between each of the patient's teeth and gently slide up and down and back and forth. Just make sure you aren't being too rough or you will cause them pain or even make their gums bleed. Use different parts of the floss or a new piece of floss as needed so you don't just move pieces of food from one side of the mouth to the other. Afterwards, have the patient rinse their mouth out with water or mouthwash. If your patient likes to use mouthwash while getting mouth care, just pour a small amount into the bottle's cap and pour it into their mouth. Let them swish it around for as long as they like. 30 seconds is recommended but most patients don't use it for that long. Whenever they are done, put the emesis basin under their chin and let them spit it out. Just like when they brush their teeth, let them get sips of water to rinse and spit in the emesis basin as many times as they want. Many patients like to use chap stick or lip balm for their lips while receiving mouth care. If none is available, you can use lotion or vaseline as well. This keeps their lips from drying out or helps heal them if they are cracked or sore. To give this care, simply put a little bit on your finger and rub back and forth across your patient's lips. Be sure to get the sides of the lips where they meet as well because those parts dry out the quickest. Something we do have at the hospital is what they call mouth swabs. They are basically little sponges on a stick. 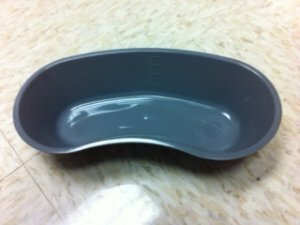 They come with a fluid that they soak in to help clean and moisturize your patient's mouth. These are a great alternative if your patient's mouth is too sensitive for a toothbrush or if they are unable to rinse and spit. They are very quick and easy to use. You simply soak the sponge in the fluid and place it inside the patient's mouth. Rub it against their teeth and tongue and turn it in a circular motion around the inside of their cheeks. If needed, use multiple swabs until the mouth is completely clean and moisturized. It may not work as well as a toothbrush would, but for some patients, it's the best mouth care they can get.